If you are looking for a state park that will offer a multitude of features to keep you interested throughout an extended stay, look no further than Sunset Bay State Park. Twelve miles southwest of Coos Bay along the Oregon Coast, the large park is a treasure trove of possibilities for those looking for a vacation on the Pacific Ocean. From hiking trails to a public golf course, to a wonderful cove, the park really does have enough to keep the most active of visitors busy. “At Sunset Bay it’s hard not to see as you come in, is Sunset Bay itself, regardless of the season or the time of day, it’s always very beautiful,” said Preson Phillips, park manager. When entering the park, which is connected to Shore Acres State Park and Cape Arago State Park, the cove welcomes you. A protected cove which as a large sandy beach, with rolling waves coming in – but nothing that would make you too nervous to have the kids wade and play in. “Obviously it’s the ocean, so you still have to be careful, but it is protected and a nice area and very popular,” Phillips said. On weekend days you can see people boogie-boarding and paddle-boarding. Phillips said the beach has also become a popular spot for ocean kayakers to launch from. If frolicking in the ocean isn’t your idea of fun – and let’s be honest, the Oregon coast can be pretty darn cold – then you don’t even have to leave your car to see the Cape Arago Lighthouse. The lighthouse isn’t accessible by car or by foot, and the best spot to view it is from a view point inside the park. In addition there are other viewpoints along the park’s road, that have lookouts to whale watch, take in a sea lion colony or see several of the native birds in the area. However, if you are travelling to Sunset Bay from Portland, you have already been in the car for several hours. Get out, stretch your feet and walk along the Oregon Coast Trail. With about 5-miles of trails that gerrymander along the coast, it can also be a pleasant way to view the wildlife, see some amazing scenery or simply work the kink out of your joints from being in the car. The wildlife is on display at two coves, where there are “world-class” tide pools that adults and kids and explore and climb. However, sometimes the coves are closed when seal pups are born. The park staff does offer educational programming during the summer months, so be sure to check with the state’s website to schedule your session. Connected to two other state parks, Sunset Bay makes a great base camp for exploring the entire area. And there are plenty of camping spots which accommodate everything from recreational vehicles that use 30-amp hook-ups, to yurts (small cabins with no bathroom) to campsites for your tent. The campsite has more than 100 spots for those wishing to stay in the park, and there are fish cleaning stations, showers, phones, garbage, firewood and biking trails throughout the campgrounds. There is also a Junior Ranger Interpretive Building that has historical lessons inside, a meeting hall and even a boat ramp. About the Shore Acres: Situated in one of the most scenic areas on the Oregon coast, Sunset Bay State Park features beautiful sandy beaches protected by towering sea cliffs. Only a short walk from the beach, the campground has sites for tent camping and RV's, as well as cozy and comfortable yurts. Day-use and picnic facilities are located along the bay to allow easy access for beachcombing, fishing, swimming, and boating. A network of hiking trails connects Sunset Bay with nearby Shore Acres and Cape Arago State Parks. Hiking these trails will give you a chance to experience pristine coastal forests, seasonal wildflowers and spectacular ocean vistas from atop the rugged cliffs and headlands. From points along the trail, you'll be treated to views of Gregory Point and the Cape Arago lighthouse. A public golf course is located next to the park and the nearby fishing village of Charleston provides opportunities for crabbing, clamming and fishing. In fact, there are plenty of secret treasures in the Sunset Bay area. Season: The park is open year-round and Phillips said that “it is very rare that we are socked in for days at a time.” Anytime you can get to the coast, and because it isn’t just a beach park, it’s got something for each season. Winter months are usually more secluded, but offer impressive storms slamming against the bluffs and cove walls. Getting there: The park is about 5 hours from Portland on the southern Oregon Coast. It’s very easy to find off of Highway 101 south of Coos Bay and west of Charleston. Simply follow the signs. The park is also listed in many GPS units as a point of interest, so when you get south of Coos Bay, take a look. 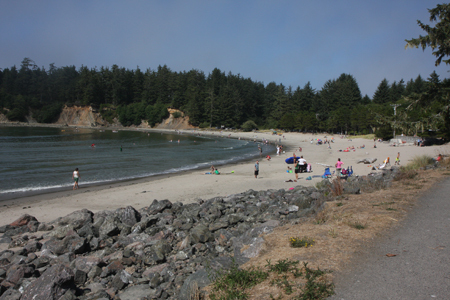 The address for the park is 89814 Cape Arago Highway, Coos Bay, Ore.